It’s March and it won’t be long before Triathlon season. By now you should start to think about coming out of your winter season conditioning and cranking it up to a harder training routine. In a Triathlon, it’s swim, bike, run and that’s how you should be training. I’m talking about brick workouts. Just doing a run on one day and a swim on the other, followed by a bike ride on the weekends will not get you ready for a Triathlon. Sure you can swim as well as run and even ride, but to be ready to do all three, one right after the other you need to be doing what are called brick workouts. Start it out easy, working your way up to the distance your going to be competing. Starting with 2 brick workouts is a good idea and will help you get back in the swing after your winter down time. After, gradually start to add in a run on your brick workouts. The goal here is that you’re doing all 3 in one workout, swim, bike and run. For some of us, this doesn’t really apply if you didn’t take the winter off in regards to your training. I myself train all year long and use this very same excuse to visit the beaches of Mexico. Shortly after the first freeze here, God and budget permitting, I make my way down to the beaches of Mexico to train in the cooler than normal ocean waters. 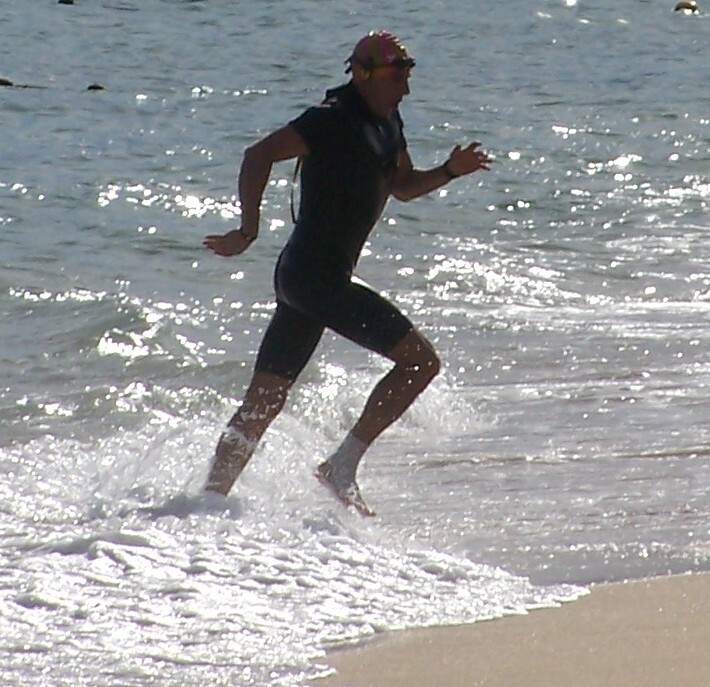 Swimming in the open ocean as well as the colder water will prepare you for any kind of conditions that might come at you in a Triathlon such as The Escape From Alcatraz Triathlon in San Francisco. Of course there is a big difference between the 65-degree ocean temperatures in Los Cabos and the 50-degree waters in the San Francisco Bay. Just the same, ocean training will help to condition your swim stroke verses training in a heated pool with absolutely no currents or swells to fight. While in Mexico, I made it a point to get my open water swim everyday. This consisted of swimming 150 meters out, across 450 meters, then back to shore another 150 meters, only to spring out the water and run the 450 meters back to where I started my swim. I would do this over and over for an hour making numerous continuous loops. Soon after this 2 brick workout, I headed to the gym at my resort to either run for 8-miles or spin out 30-miles on their spin bikes. Sounds tremendously painful, not really as much as the swim was. During a weeks time of my training in Los Cabos the Jellyfish there had stung me over 22 times. After awhile you get use to it and as Dori would say, “just keep swimming.” Make no mistake Modesto View friends, the Sea of Cortez is very much alive with sea life. You must prepare. One of the first things I do is hire a crew to guide me. Two kayaks, one on each side of me with a boat that circles us in case of an emergency. I also have a heavier than normal wetsuit incase a sea creature decides to nibble. It hampers my swim stroke but well worth it. Dangerous? Sure. Since I started doing this swim back in 2009 I have had Humpback Whales come up on me as well as giant Squids that measured 18 feet long, that locals call the Red Devils. The Squid in these waters are notorious for hunting in packs and attack like no other, latching onto your limbs they try to drown you and while doing so they use their parrot-like beaks to rip into you. 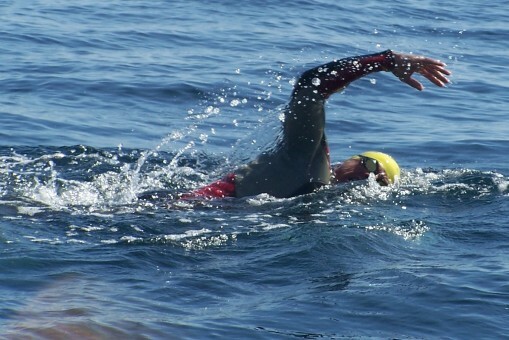 Scary, sure but these are the kinds of mental challenges that will prepare any Tri-athlete for an open ocean Triathlon. In the photo here, you can see a squid that measured around 18 feet come up next to me during my swim across The Sea of Cortez in 2011. This was just one of 2 that came up on me. Honestly, none of the guides or myself knew they were there. It wasn’t till I got home a few days later and was studding my stroke in photographs that I noticed these 2 creatures from the deep that where right on me. Thankfully they both decided to “just keep swimming,” thanks Dori. It’s no secret; my weakest event in a triathlon is the swim. As a runner, I found that when I was swimming I had a tendency to point my toes down instead of strait out. If your toes aren’t pointing strait out, they can slow you down as if you had anchors or your feet. This type of swimmers handicap is called runners feet. Let’s talk about your swim kick; it’s a myth that you need to have a strong swim kick to win a Triathlon. Your kick should be more about balance than strength. Sure a strong kick will help if your in a pool swimming in a 200 meter race, but in open water Triathlon, the distance can be anywhere from 1Ž4 mile swim to 2.5-miles. Using a strong kick for more then 200 meters will tire you out very fast. Focusing more on your stroke will save strength for your legs, which you will need for the ride and run of the Triathlon. Below are some informative swim tips as well as how you can correct your running swimmers feet. Training in a pool is good, but training in open water is much different and the stroke you use in the pool may not always work in the open ocean due to the current, waves and chop that can toss you around like a rag doll. Get your swim in everyday at the same time you would be starting your Triathlon. This will help you get acclimated to swimming so early in the morning. To acclimate yourself to a cold-water swim, try taking as many cold showers as you can or swim in the same open waters prior to your triathlon. To correct your swimmer’s runner’s foot, try sitting on your feet as often as you can. Swimming with zoomers will help you with foot form. Note: use them more so for balance and form and not for speed. Kicking with zoomers while holding onto the side of the pool will also help you correct your runners foot for swimming.